The Senate Special Select Committee resumed its investigation into the Auditor General’s Special Audit report on Wednesday, June 28th. The Committee continued its inquiry into allegations of corruption at the Passport, Visa, and Nationality Departments between 2011 and 2013. After being interrogated last week, Immigration Clerk Ady Pacheco reappeared before the senate panel to discuss a lot of administrative irregularities. Within the Auditor General’s report, her name is mentioned over 90 times for improperly granting nationality, visas, and permanent residence. Chairman of the Senate Select Committee, Honorable Aldo Salazar challenged Pacheco on why she didn’t closely inspect the files she accepted as a frontline immigration officer. She responded that it was not her duty to spot fraudulent documents being submitted as part of applications for visas and nationalities. After Senators asked her to explain why she didn't see that as part of her responsibility, she revealed the shocking truth, that no one at the Immigration Department did any kind of verification of whether documents were authentic or not. Senator Mark Lizarraga also pressed Pacheco on the same topic. “There was no verification of anything. We went by whatever was in the file, and at face value. There was no set procedure that said that we have to verify extension stamp, residency stamp, work permit stamp, or even arrival stamp. This recommendation is no way or form a verification of any of the documents in there,” said Pacheco. Lizarraga then asked who was responsible for verifying the documents. "I am trying to make you understand that there is no set person, or section that dealt with only verification. There was no verifications done at the time. If, let's say, they saw the need to verify something then the investigation section would be the one to do it. But, they weren't tasked with that. Investigation section helped us with the interviews too,” said Pacheco. 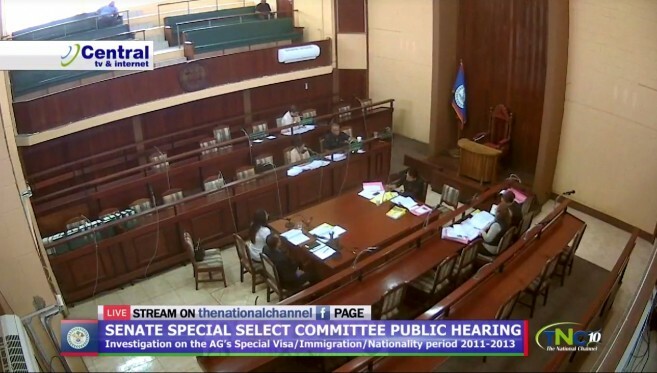 Pacheco was also questioned about the case involving the Harmouch family of San Pedro Town, Ambergris Caye, and Minister of Tourism and Civil Aviation Manuel Heredia Junior. In the case of Mohammed Hami Harmouch, he was interviewed for nationality but was not recommended by Immigration Officer in Charge, Gordon Wade. However, Gertrude Armstrong, who assisted Wade in nationality application reviews, along with Pacheco, granted him nationality. Sentator Eamon Courtenay asked Pacheco if she recalled dealing with an application for Mohahmed Hani Harmouch. She indicated that she was not sure, and stated that there were many Harmouch applications from San Pedro. She testified that Minister Heredia wrote them recommendations, and assisted them. 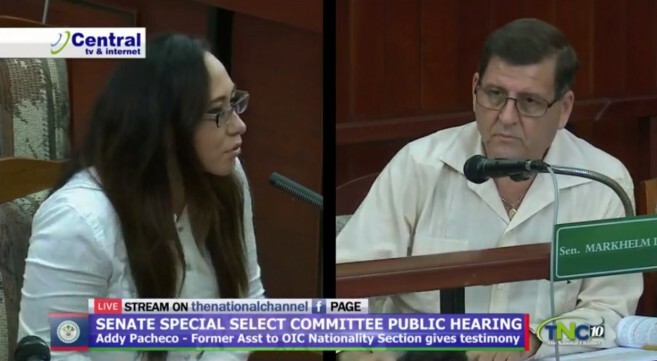 Courtenay asked Pacheco if she was aware that Mr. Gordon Wade did not recommend this man for nationality, and prompted her to read a paragraph within the report. “The OIC Nationality Section, Mr. Gordon Wade, did not recommend the applicant for nationality; but wrote a note date eleventh January, 2012 was made by Ms. Gertrude Armstrong, who was a clerk in the Nationality section, who recommended the applicant for nationality to the Director,” said Pacheco. She stated that she could not speak on behalf of Armstrong, and does not know why she approved of Harmouchs’ application. Minister of Human Development Anthony Martinez was also summoned by the Senate Select Committee to testify, but the Committee postponed his testament until next week. Martinez told the media that he was more than willing to come forward because he wanted to respond to the allegations that Alvarine Burgess made against him. Although Burgess was not named in the report, she came forward and said that while she was an immigration agent, she paid Martinez several thousands of dollars in bribe money so that he would write recommendations for Chinese visa applicants, guaranteeing that the visas would be approved. Martinez denies all of these allegations, and considers Burgess’ statements as “hearsay” without any basis or foundation. “She is nowhere in that report. And for even myself to be answering or try to reply to hearsay – Mrs. Burgess is not in that report at all; that is why I say I find it to be a circus. Somebody who is not in the report you call; you summon me to come as Minister and then you tell me you not ready for me yet; when in my view, my humble opinion, who was not named in any report, who is not a Minister, who is not a public officer, was summoned before the Senate Select Committee. I find it to be a joke, like a circus,” said Martinez. The Senate Select Committee resumes on Wednesday, July 5th with appearances from two Ministers of Government, Anthony Martinez and Edmond Castro.